Advancements in imaging technologies over the past several decades have allowed for the identification of non-intraocular pressure (IOP) processes involved in glaucomatous optic neuropathy. Perhaps the most commonly cited non-IOP risk factors are impaired ocular circulation and/or faulty vascular regulation and vasospasm [1, 2]. Other important considerations include the possible synergistic interaction between IOP and intracranial pressure (ICP) and their effects on ocular structure and circulation . The ability to assess ICP in glaucoma has been significantly limited by the highly invasive nature of ICP measurements. Recently, the ability to quantify ICP noninvasively has significantly improved, with pilot data suggesting a link between low ICP and glaucoma . Even though the limited data on the topic prevents us from drawing definitive conclusions, the emergence of noninvasive assessment protocols holds great promise to define the pathway of ICP’s involvement in glaucoma. In this article, new data and analysis on cerebrospinal fluid pressure (CSFp) and its impact on optic nerve and retinal microcirculation will be explored alongside the broader implications of ICP in glaucoma. One difficulty in interpreting ICP as a risk factor for the onset and progression of glaucoma is the interplay and possible synergies among IOP, ICP, and the ocular circulation. 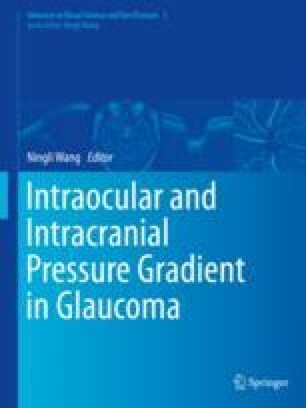 Advances in physically based mathematical modeling have recently allowed for the exploration of glaucoma risk factor interconnectivity [5–9], providing further insight into glaucoma pathophysiology, and eventually may allow for individualized screening and improved patient-specific treatment options . The concepts of ICP, pilot data, and future paradigms in glaucoma management are presented herein, with a focus on comprehensively understanding the role and impact that ICP may have on glaucomatous optic neuropathy. Dr. Alon Harris would like to disclose that he receives remuneration from CIPLA, AdOM and Shire for serving as a consultant. Dr. Harris also holds an ownership interest in AdOM and Oxymap. All relationships listed above are pursuant to Indiana University’s policy on outside activities. None of the other authors listed have any financial disclosures. This work has been partially supported by the NSF DMS-1224195, NIH 1R21EY022101-01A1, a grant from Research to Prevent Blindness (RPB, New York, NY, USA), an Indiana University Collaborative Research Grant of the Office of the Vice President for Research, the Chair Gutenberg funds of the Cercle Gutenberg (France), and the Labex IRMIA (University of Strasbourg, France). The funding parties did not have any role in the study design, collection of data, analysis of data, writing of the manuscript, or decision to submit the manuscript. Moore NA, Harris A, Wentz S, Verticchio Vercellin AC, Parekh P, Gross J, Hussain RM, Thieme C, Siesky B. Baseline retrobulbar blood flow is associated with both functional and structural glaucomatous progression after 4 years. Br J Ophthalmology. 2016; https://doi.org/10.1136/bjophthalmol-2016-308460.